While most people assume that a crest has always been part of the Chi Phi Fraternity, it was not until 1948 that the Fraternity finally adopted one. Why would the oldest social fraternity have one of the newest crests in the fraternity world? The complete story of how this widely recognized symbol was created has never been told, until now. In today's world, Greek letters are prominent on chapter houses and on every conceivable type of clothing, but many brothers in the early 1900s strongly objected to such outward displays. To them, it was an honor to be a Chi Phi, and a true gentleman didn't " brag" about his status as a member of the Fraternity. The badge was symbol enough for each man; even it was worn discreetly under one's jacket. This conservative view was widely held, so there were few public symbols of the Fraternity. In 1915, Wyndham Stokes, Psi 1888, who had served as Grand Gamma from 1899-1906, proposed a crest, which incorporated the three basic symbols taken from the Fraternity's three-part history, although arranged differently than today's official crest. 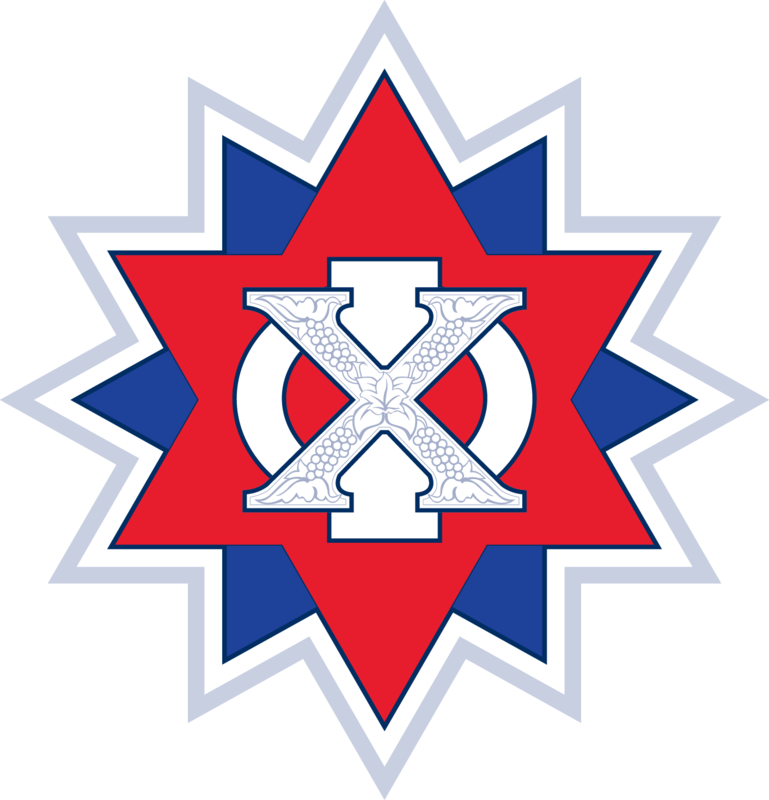 Brother Stokes took his creation to the 1915 Chi Phi Congress held in San Francisco, where it was referred to a committee, but eventually fell from discussion at Congress or Grand Council meetings. The Congresses of the past have gone on record as opposed to hat bands, pennants, or other means of advertising. It would seem that the badge, alumni emblem, and service ring constituted sufficient personal adornment in line with conservative good taste, and that the display of certain insignia should be confined to the lodge rooms. On the other hand, the desire and possible necessity for some insignia for use in the rooms of students or homes of alumni should be recognized and provided for in a uniform and authorized manner. Unless Congress desires to take immediate action, these matters should also be referred to and considered by the proposed Committee of experts in law, heraldry, tradition, and art. Congress agreed that the idea should be referred to a committee. The Grand Council appointed a group of six Chi Phi's from " all shades of opinion and sections of the country" as a Reviewing Committee to comment and improve on an official insignia report prepared by the Council itself. Over the course of the next year, the Reviewing Committee exchanged reports with the Grand Council. These exchanges led to a recommendation to adopt a crest for use in fraternity publications and college annuals, as well as in the lodge room. Other items agreed to be acceptable for public display were the badge, the alumni emblem, the service ring (worn instead of the badge by those in military uniform) and the wall plaque approved in 1916. However, the official position still rejected the use of any fraternity insignia or the Greek letters " Chi" and " Phi" on ribbons, hatbands, stationery, or silverware. At the Congress of 1924, a Committee on Insignia was assigned the task of considering the recommendations. There is little insight into the discussions of that committee, but their report to Congress is very clear. They approved all the previously existing insignia, but in the matter of the crest, they submitted: The Committee wishes the thanks of the Congress extended to Brother Shaw of Delta for the design of a Coat of Arms which he submitted for adoption. Your committee does not approve the adoption of a Coat of Arms for the fraternity. It suggests for use in college annuals and fraternity publications a simple engraving of the badge. Just when the crest seemed to find favor, the prevailing attitude of the leaders and delegates decided against the idea. For the next decade, efforts to create a crest were put aside while Fraternity leaders attended to other issues of the day. In 1936, Donald E. Williams, Alpha-Chi 1938, having no knowledge of any of the previous efforts, took it upon himself to create and promote the idea of adopting an official Chi Phi crest. Having served as Chapter Alpha and involved in various campus activities, Brother Williams noticed that most other fraternities at Ohio Wesleyan had crests they proudly displayed. Believing that his own fraternity deserved such a symbol, Williams decided to enroll in a heraldry class in the art department and design a crest for Chi Phi as his main project for the course. As a result, George M. Austin, Alpha-Chi 1928, described Williams' crest elegantly in The Acorn, the alumni newsletter of the Alpha-Chi Chapter. He wrote in 1936, "The Crest itself is a work of art and shows a mastery of detail and a completeness which is almost impossible to appreciate unless the design is seen. Every symbol of the fraternity is somewhere woven into the structure of the Crest. The dates of the founding of the three orders are accorded their proper places as is the pin, the Chackett [sic] and other Chi Phi indicia." With his design in hand, Brother Williams attended the 1936 Chi Phi Congress in New York City as an Alpha-Chi Chapter delegate. His original artwork was displayed on and off the floor of Congress to the satisfaction of many of the delegates. The Committee on New Jewelry included in their report a recommendation to adopt Brother Williams' design as the official crest of the Fraternity. After discussion of the committee report, action on the crest was postponed, and later during the Congress, Crawford J. V. Rainwater, Gamma 1937, motioned that the Grand Council be given full authority to decide on the adoption of the crest. The Congress agreed and left the decision to the Grand Council. With the help of his chapter's alumni, a campaign to promote the crest was conducted through word-of-mouth and other means. As Brother Austin detailed in his Acorn article: "It is planned to have printed several copies of the 8 x 10 drawing which has been completed to date and to send them to Chi Phi groups throughout the country, including active chapters, chartered alumni groups, etc. It is hoped that in this manner a universal interest in the adoption of the Crest may be manifest." The Grand Council considered the crest at its December 5, 1936, meeting. At that time, Benjamin Russell, Alpha 1899, who had served on the 1923 Reviewing Committee, motioned that no official crest be adopted, but the Council should express its appreciation to Brother Williams for his efforts. The Council agreed. Brother Williams continued his efforts and returned to the Chi Phi Congress when it met in 1937 in French Lick, Indiana. Again, the delegates responded favorably, but no action was taken. "Most people who saw the design liked the idea," recalls Williams. "I believe one reason it was not adopted in 1936 or 1937 was because of the concern some people had for the use of the fasces. Remember, this was near the peak of fascism in Europe, and I think the leaders of the Fraternity thought that using this symbol would inadvertently connect Chi Phi to that movement." Having attended two consecutive Congresses without success, Brother Williams shifted his attention to his studies as he prepared for graduation. Sometimes, however, a good idea refuses to die. The crest was again discussed at the 1940 Congress. In fact, the crest idea merited its own committee. Theodore W. Lanman, Xi 1941, chairman of the Committee on the Crest, reported that after full discussion, 75% of the members of the committee favored the adoption of the crest, which was displayed by the committee to the Congress. Richard N. Ames, Alpha-Chi 1941, moved the adoption of the crest. Joe Frank Smith, Sigma 1941, expressed approval of the crest, stating that all the chapters at the University of Illinois had such an emblem. Robert I. Crane, Alpha-Mu 1941, opposed the adoption of the crest on the grounds that it did not identify the Chi Phi Fraternity and no one could interpret its meaning without knowing the secrets of the Fraternity. James P. Coho, Zeta 1941, asked that a vote be taken on the adoption of the crest. The motion for its adoption failed to carry. During World War II, Congress was suspended. After the war, the Fraternity returned to business, and the crest again appeared on the Congressional agenda. Once more a committee considered the crest, and once more the committee brought to the floor of Congress a favorable motion. George L. Freeman, Xi 1949, as chairman of the Committee on the Crest, motioned that the Council be authorized to adopt a crest for the Fraternity. The motion was seconded by Kingsley Humbert Jr., Mu 1948, and was approved by the Congress. This time, unlike 1936, the Grand Council was in favor of the crest and action occurred quickly. By the October Council meeting, the L.G. Balfour Company was working on official drawings of the crest. Balfour took Brother Williams' original design and produced a commercial full-color printed version, as well as a bronze three-dimensional version. Balfour's adaptation of Brother Williams' design was ready for the Grand Council meeting of January 28, 1948, where it was finally approved as Chi Phi's official crest. Credit was given, along with appreciation, to Brother Williams in the official minutes of the meeting. The crest went public at Congress that year, when Grand Alpha J. Pollard Turman, Gamma 1934, made the official announcement and noted that a ring with the crest had been added to the official jewelry of the Fraternity. The Fraternity Press, then publisher of the Chakett presented to Congress five hundred prints of the crest suitable for framing. It made its first Chakett appearance on the cover of the February 1948 issue. Today, the crest is a public symbol for the brothers of Chi Phi, one that is instantly recognizable to members, but still appropriately obscure to outsiders. It communicates our proud history without overt bragging.